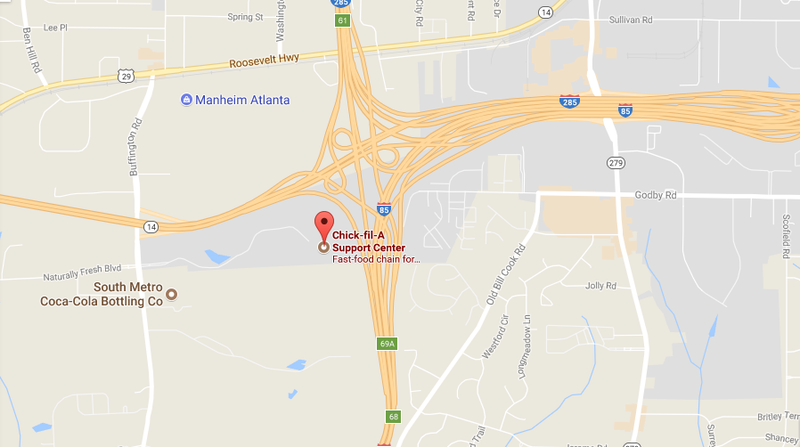 Chick-Fill-A is headquartered in College Park, Georgia, United States. The American fast food restaurant specializes in offering chicken sandwiches The fast food restaurant chain has over 2000 locations operational throughout the United States. The franchise was founded by S. Truett Cathy and Dan T. Cathy is the CEO of the company. At Chick-Fill-A one can find a broad array of chicken recipes and sandwiches. Company Headquarters provides you a complete detail of the Chick-A-Fill headquarters and customer service contact details. Read on to get in touch with the customer service department and access headquarters information. You can visit the customer service center located just south of downtown Atlanta at 5200 Buffington Road, Atlanta, GA 30349. You can get customer support through Twitter. Tweet your complaints @ChickfilA and enjoy instant support. The mobile applications of Chick-F-A are available for the App Store and Google Play. One can earn free treats, order their favorite recipes and more just at a click of their mobile screen. The mobile applications feature an extremely user-friendly console that enables you to order ahead, earn free treats, access a customized menu and pay for orders using mobile payments.